Western blot analysis of extracts from various cell lines and tissues using Akt3 (E1Z3W) Rabbit mAb (upper) and Akt (pan) (C67E7) Rabbit mAb #4691 (lower). 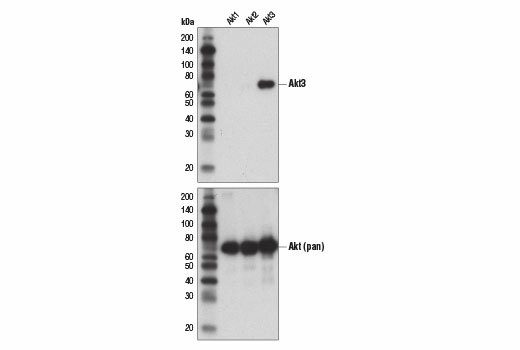 Western blot analysis of recombinant Akt1, Akt2, and Akt3 proteins using Akt3 (E1Z3W) Rabbit mAb (upper) and Akt1 (pan) (C67E7) Rabbit mAb #4691 (lower). 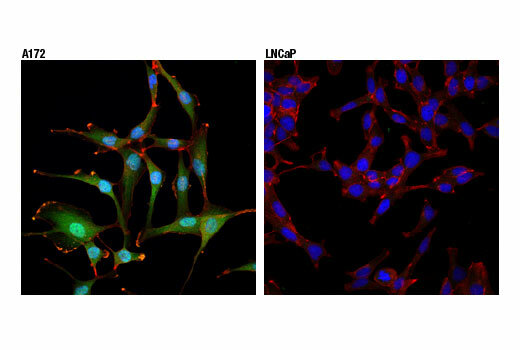 Confocal immunofluorescent analysis of A172 (positive, left) or LNCaP (negative, right) cells using Akt3 (E1Z3W) Rabbit mAb (green). Actin filaments were labeled with DyLight™ 554 Phalloidin #13054 (red). Blue pseudocolor = DRAQ5® #4084 (fluorescent DNA dye). 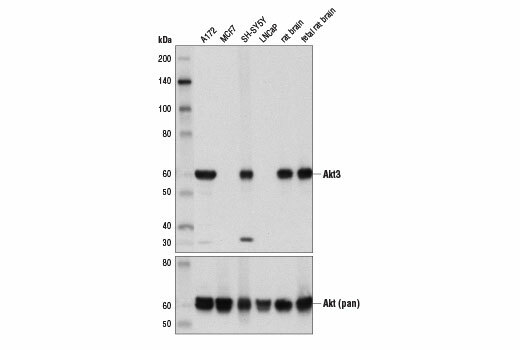 Akt3 (E1Z3W) Rabbit mAb recognizes endogenous levels of total Akt3 protein. Monoclonal antibody is produced by immunizing animals with a synthetic peptide corresponding to residues surrounding His140 of human Akt3 protein.